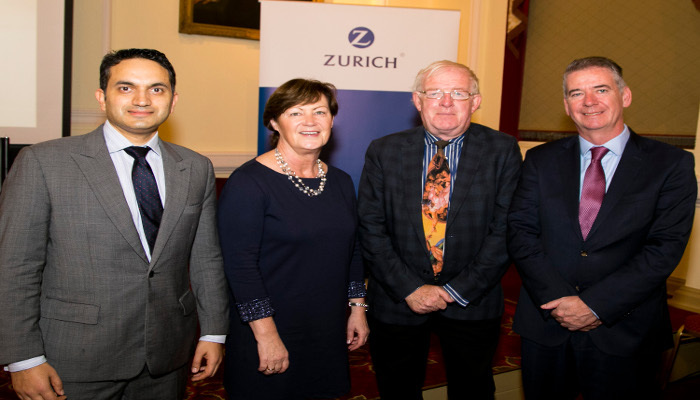 Economists Colm McCarthy (UCD) and Julien Seetharamdoo (Zurich) joined Rose Leonard and Joe Creegan for Zurich's conference for trustees of pension schemes in November. Opening Zurich's Pension Trustee Conference, Rose Leonard, Head of Corporate Sales and Customer Relationship Management at Zurich, asked the trustees present to embrace the Codes of Governance published by the Pensions Authority in 2016. She also pointed out that having a good, transparent decision-making process can both protect trustees themselves and help them achieve better outcomes for their scheme members. "Most individual pension scheme members have limited knowledge of investments and simply don't have the time or interest to get actively involved in decision making or investment fund selection," Leonard said. "Trustees in Ireland are responsible for assets of over €120bn, and it is imperative for DC schemes to have a good default investment strategy in place for members. It is probably the most important decision that trustees will make." Trustees and employers at Zurich's Pension Trustee Conference also heard from leading experts on the key influences that can determine the investment performance of a scheme and how value can be added to their members' funds. Julien Seetharamdoo from Zurich in Switzerland spoke about the European political and economic influences affecting investment funds, and Economist Colm McCarthy's talk focused on the sustainability of the current pension system in Ireland. A lively panel discussion, chaired by Zurich's Joe Creegan, heard from independent non executive director Joan Garahy and a European HR Director Jacinta Sheils both of whom had real insights into how people behave when it comes to making investment decisions. Attendees also heard from Richard Temperley, Head of Investment Development at Zurich on how trustees can add value through asset allocation. The final speaker at the conference was Thomas Synnott, Zurich's Head of Corporate Life and Pensions Proposition. He spoke about post retirement investment options and why advice at the point of retirement is critical.